Make cherished memories on a family vacation with Grandeur of the Seas! 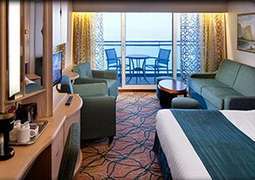 Treat yourself, your partner, or the whole family to a royal experience on the Grandeur of the Seas. Whether you're looking to feast your eyes on the gorgeous Indian summer of New England and Canada or itching to explore exotic island destinations, this state-of-the-art Royal Caribbean ship provides stylish comfort, a variety of gourmet cuisine, several distinctive bars, live music and theater performances, sports and fitness facilities, a relaxing spa, and much more. The ship and activities on offer are designed to give you the perfect vacation - whether that means couples lounging in the adults-only solarium or rock-climbing with the family. 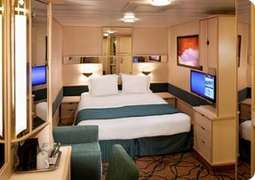 Every room on board the Grandeur of the Seas features flat-screen televisions, internet access, sitting area with desk, mini-bar, and other amenities. 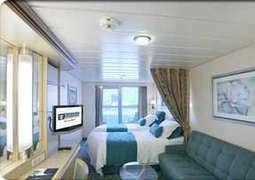 From the smallest interior rooms of about 140 square feet to suites ranging from 350 to 500 square feet, you are bound to enjoy the nightly turndown service, 24-hour room service, and the attention of a round-the-clock stateroom attendant who can assist with any room-related requests, from ice to extra towels. The cruise features some Royal Caribbean mainstay dining options, like the international buffet featuring fresh-pressed juices, paninis made to order, and a variety of soups, pastas, sandwiches, and desserts on its menu, which changes daily. For guests looking to indulge in unique dining experiences, "Chops Grille" offers classic American steakhouse fare, and foodies will love the gourmet five-course experience at the intimate and exclusive "Chef's Table." The globally curious diner can plan for a lunch or dinner at "Izumi," serving up Japanese cuisine, or "Giovanni's Table" for a taste of Italy. Royal Caribbean presents original productions on board the Grandeur of the Seas, from live jazz shows to techno-inspired cabarets and "Tango Buenos Aires," a music and dance production celebrating the rhythms, love, and passion of tango. Guests looking to get their hands involved in something new can sign up for cooking, dance, jewelry-making, fitness, and language classes. The kids can stay active, with a rock-climbing wall, youth program, swimming pools and well-stocked arcade all catering to them, while adults can indulge at the onboard casino or wine tastings. While casual clothing is acceptable during the day and in restaurants for breakfast and lunch, be sure to pack some smart casual and formal attire for the evenings. T-shirts, bathing suits, tank-tops, and shorts are off-limits for restaurants in the evening, which require smart casual or formal attire. 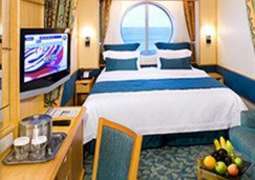 Usually one night of a five-night cruise will feature a formal dinner, with ladies expected to wear cocktail dresses and men full suits or tuxedos.